Smiths dual oil/water temp gauge repair? Please understand I am not suggesting any one buy bulk ether. When you buy the cheap gauge, there is ether in that gauge in that bulb. When you put the bulb in the ice bath, you are stabilizing that ether, it stays in the bulb while you solder. You are going to do this once or twice. Buy the cheap gauge, use it. Unless you are going to go into the business of fixing gauges, I don't see the need to buy bulk ether. When I looked into this a few years ago, I could not find any sources of 'cheap' temperature instruments in the UK, it seemed to be a USA only option. I like the idea of using brass tube as the joining mechanism instead of trying to drill a fine hole in a brass rod. I had forgotten about the availability of brass tube. billwill wrote: When I looked into this a few years ago, I could not find any sources of 'cheap' temperature instruments in the UK, it seemed to be a USA only option. it also possible to source for cheap samples of soft (ductile) copper in many capillary dimensions : that is what I opted for so that the solder on piece would just slip over the original tubing, it would hide easily under the spring protection, is pliable (though less than the stock inner tubing) and of similar color when tinned. tvacc wrote: The 37 degree thing has nothing to do with out side temp. That is the temperature that ether turns to liquid. You will find that plain ice in water will cool the bulb to 36 to 37 degrees. By adding salt to the ice, you get down to 32 or so. At that temp, the ether is a fairly stable liguid and will stay in the bulb in the salt/ice bath. Hey guys, you're talking ice freezing at 32 °F but the boiling point of ether is 37 °C. If you look at your broken gauge you will see that the indicated temperature is 37° and, ideally, is what the temperature of the ether should be when you seal the tube. Sealing it while the ether is at 32 °F will give wrong readings but probably not badly at 90 °C where it matters. No, I don't think you are right. That sort of error might occur if the whole bulb and tube and gauge are filled completely with ether, but provided that there is some liquid and some ether gas it should read correctly. Thats why you only half fill the bulb with liquid ether. The 37 degC (it's CENTIGRADE NOT FARENHEIGHT and is actually 34.6degC) spoken about is the 'boiling point' of ether AT ATMOSPHERIC PRESSURE! Because it is a sealed system, as the temperature (of the engine coolant in this case) rises, more of the ether boils off until the vapour pressure is the pressure corresponding to the boiling point of ether at that new temperature. It is this pressure that the gauge measures by causing a bent tube to straighten out a little, while connected to the needle on the gauge face. it does not matter the exact temperature at which the diethyl-ether is when the capsule is sealed, provided that there is some of it left (in sufficient quantity and pure enough) after soldering. Then it will evaporate when the capsule is heated by the engine, and the gauge will read out the pressure inside the setup and translate that into a temperature. The cooling of the capsule during soldering is merely for keeping the ether liquide while heating a highly thermally conductive copper part of the yet unsealed setup - iced water is just a convenient way of doing that. 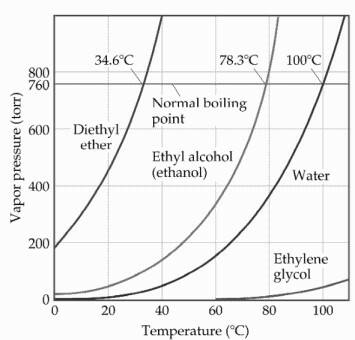 I tried to find a handy graph on the internet showing the vapour pressure of ether at 100 deg C (boiling point of WATER) but most of the graphs don't go that far. So our engine temperature gauges are 'really' pressure gauges working in the approximate range -5 psi to + 20psi (say). There must be both liquid and vapour in the sealed system over the whole temperature range for it to read the vapour pressure correctly, if all the ether turns to vapour, it won't read correctly. As Elton John sang "All the science I don't understand, its just my job 5 days a week"
I don't really know why or how it works. All I can tell you is that I have fixed more than a half dozen of these combo gauges exactly as I described and they all work fine. I test them with boiling water, putting the bulb in the water without touching the bottom and all the gauges read 100 degrees centigrade. tvacc wrote: As Elton John sang "All the science I don't understand, its just my job 5 days a week"
The mechanical temperature gauge is actually a bourdon tube pressure gauge reading in degrees C or F. Ether is a hydrocarbon fluid with a known vapor pressure curve that goes from 0mm/hg at 0C to 7500mm/hg at 120C. The temp/pressure curve is well understood and the gauge is calibrated to read in degrees to the relative pressure. That's about the best I can 'splain it. There is no cure for Lotus, only treatment. According to the graph I showed above the vapour pressure of ether at 0 degC is about 200mm/hg not zero.